Elder law is a blanket term for legal issues that commonly affect the elderly. These legal issues may include planning for asset protection, long-term medical care (such as Medicaid or VA services), estate planning, guardianships, conservatorships, and even elder abuse. Regardless of whether you are seeking long-term medical care today, or just want to plan effectively to ensure you have access to the care you need at the time you need it, it is important to speak with an experienced Elder Law attorney. The federal Medicaid system can often help cover costs of long-term care. In Arizona, that long-term care is provided through the Arizona Health Care Costs Containment System (AHCCCCS) under a program known as the Arizona Long Term Care System (ALTCS). Qualifying for ALTCS is dependent on financial and medical eligibility, but the criteria for determining—especially the financial—eligibility can be confusing. In certain circumstances, simple transfers such as gifts to family members can delay eligibility considerably. If you think you might qualify now or in the future, it is important to speak with a qualified Elder Law attorney for advice. For those who have served in the U.S. armed forces, Veterans Affairs benefits may also be available to pay for your long-term care. 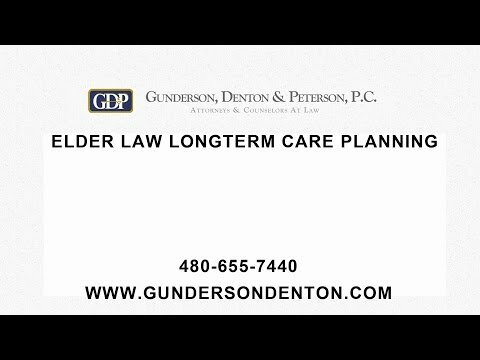 The Elder Law attorneys at Gunderson, Denton & Peterson can help you evaluate those options as well. Regardless of whether or not you are seeking government-assisted long-term care, asset protection and estate planning is an important part of planning for the future. Those seeking Elder Law attorneys frequently have important questions about how they can best protect their assets for themselves and for their loved ones. Proper asset protection and estate planning can involve a variety of strategies including the use of Wills, Revocable Living Trusts, Irrevocable Trusts, Powers of Attorney, family limited partnerships, business succession plans, and more. The Elder Law attorneys at Gunderson, Denton & Peterson are experienced in these important areas of the law. When an individual lacks capacity to care for himself or herself, the court can appoint a Guardian and/or Conservator to step in and make important decisions. A guardian is appointed to look after the incapacitated individual (generally referred to as a “ward”). A guardian is authorized to make decisions regarding the ward’s living arrangements, medical treatments, and to look out for the ward’s general well-being. A conservator is authorized to manage the ward’s assets. A court may appoint a guardian and not a conservator, or a conservator and not a guardian. In many cases, both a conservator and a guardian will be necessary. In all cases, guardians and conservators have a legal duty to act in the best interest of the individual they have been appointed to assist. If you think that you or a loved one might need the help of a guardian or conservator, it is important to speak with an experienced attorney who can advise you about legal ramifications of that decision. The attorneys at Gunderson, Denton & Peterson answer any question you might have about the process. Learn more about Guardianships and Conservatorships. Elder abuse is a serious issue. Unfortunately, it is all too common in Arizona. Elder abuse can take many forms. In some cases, influential family members, friends, or caretakers may steal or embezzle funds. In other cases, they might encourage a vulnerable adult to make decisions that are not in that person’s best interest. This can lead to severe financial and emotional distress. In some cases, the abuse may even by physical. Regardless of the situation, it is important to meet with an experienced attorney if you or someone you love is at risk of elder abuse. Certain planning techniques can help limit the possibility of future abuse. 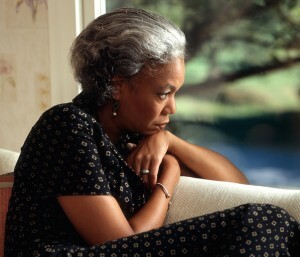 Where abuse is already taking place, a qualified elder law attorney will be able to help resolve many of those issues. Sometimes this will mean appointing a conservator who will help the vulnerable adult by managing his or her assets. Sometimes it will mean appointing a guardian who can help make important health care decisions. Sometimes it will mean helping the victim of elder abuse enter into a quality long-term care facility where he or she can safely receive the quality of care needed. In certain cases, it may even mean bringing a lawsuit against those who have violated the law. The attorneys at Gunderson Denton & Peterson, P.C. are experienced in these areas of the law and can advise you or your loved ones who may be facing elder abuse.